How do different social networking websites stack up when it comes to news? How many people engage with news across multiple social sites? 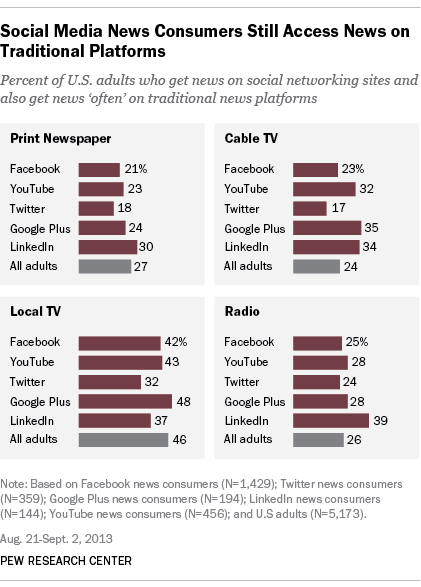 And what are their news consumption habits on traditional platforms? As part of an ongoing examination of social media and news, the Pew Research Center in collaboration with the John S. and James L. Knight Foundation analyzed the characteristics of news consumers and the size of their population across 11 social networking sites. News plays a varying role across the social networking sites.1 Roughly half of both Facebook and Twitter users get news on those sites, earlier reports have shown. On YouTube, that is true of only one-fifth of its user base, and for LinkedIn, the number is even smaller. And Pinterest, a social pin board for visual content, is hardly used for news at all. The proportions who get news, combined with the total reach of a site, show how many U.S. adults are learning about events and issues through each social networking site. Facebook is by far the largest social networking site among U.S. adults, and with half of its users getting news there, is also the largest among U.S. adults when it comes to getting news. As discussed in an earlier report, roughly two-thirds (64%) of U.S. adults use the site, and half of those users get news there—amounting to 30% of the general population. YouTube has the next greatest reach in terms of general usage, at 51% of U.S. adults. Thus, even though only a fifth of its users get news there, that amounts to 10% of the adult population, which puts it on par with Twitter. Twitter reaches just 16% of U.S. adults, but half (8% of U.S. adults) use it for news. 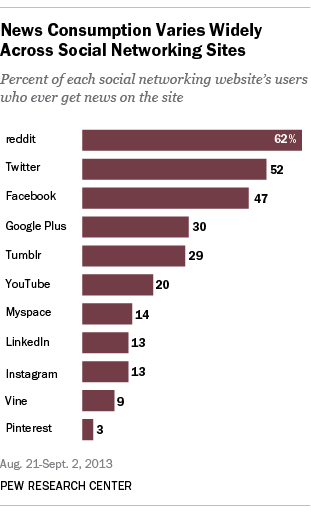 reddit is a news destination for nearly two-thirds of its users (62%). But since just 3% of the U.S. population uses reddit, that translates to 2% of the population that gets news there. 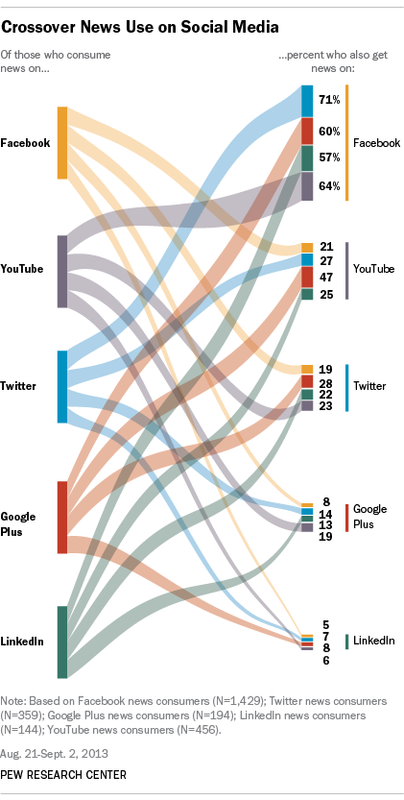 To what extent do the various news audiences on social media overlap? A look at the five social networking sites with the biggest news audiences shows that a majority of news consumers on those sites (65%) get news from just one, and for 85% of those, it is Facebook. 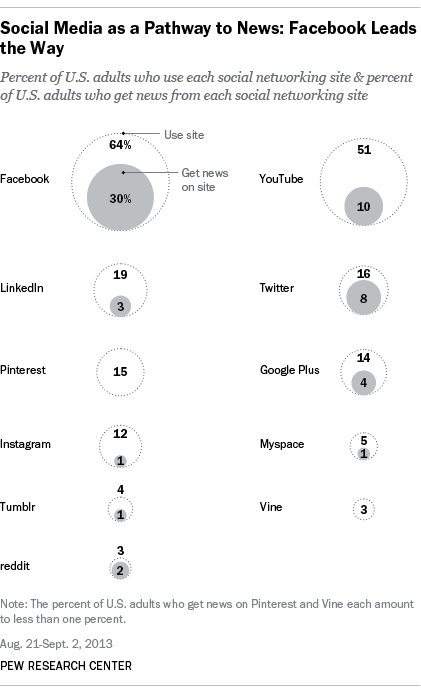 About a quarter (26%) gets news on two of those sites. And 9% get news on at least three. For those who get news on multiple social networking sites, Facebook is likely to be one of the ones they use. 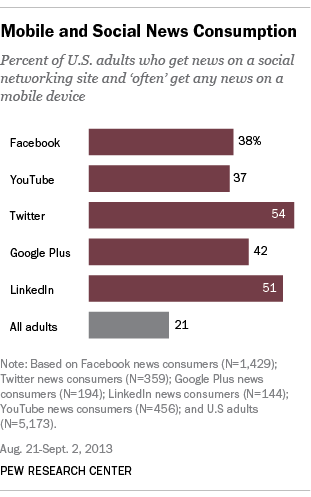 More than half of adults who get news on Twitter, Google Plus, LinkedIn and YouTube also get news on Facebook. Aside from that, the shared audience between these sites is relatively small. 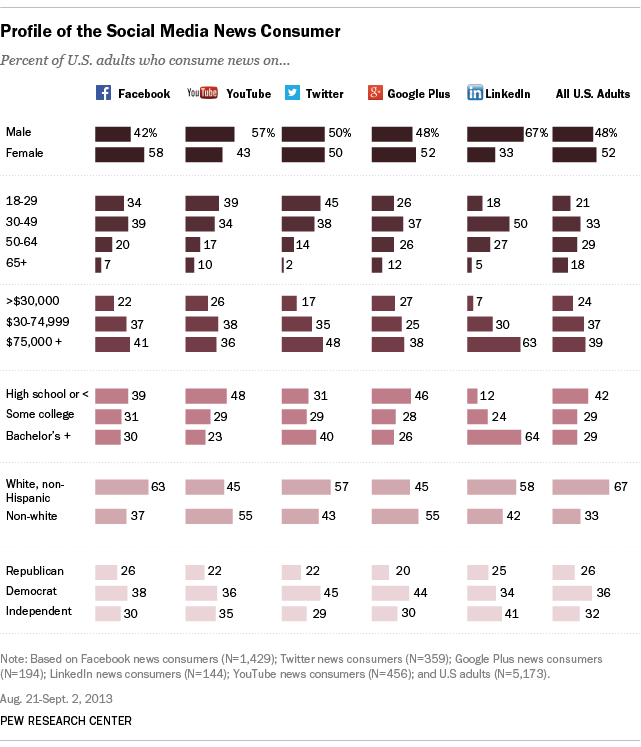 A look at the demographic characteristics of news consumers on the five social networking sites shows that, while there is some cross-over, each site appeals to a somewhat different group. LinkedIn news consumers stand out from other groups as more likely to be high earners and college educated. Twitter news consumers are significantly younger than news consumers on Facebook, Google Plus and LinkedIn. And Facebook news consumers are significantly more likely to be female than news consumers on YouTube, Twitter and LinkedIn. News consumers on social networking websites are more likely than the general public to use a mobile device for news, including roughly half of Twitter and LinkedIn news consumers. This report is based on a Pew Research Center survey conducted Aug. 21-Sept. 2, 2013, among a nationally representative sample of adults 18 years of age or older. The sample included 5,173 respondents. The survey questionnaire was written by the Pew Research Center and administered by GfK using KnowledgePanel, its nationally representative online research panel. For questions asked of the full sample of 5,173, the margin of sampling error is plus or minus 1.7 percentage points at the 95% confidence level. 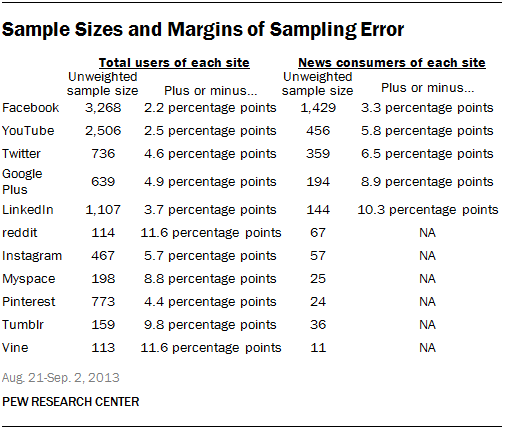 The following table describes the sample sizes for users and news consumers on each social networking website included in the study, as well as the margins of error for each. For more details on the survey methodology, see the methodology section of The Role of News on Facebook.